This is one of my husband’s favorite recipes. 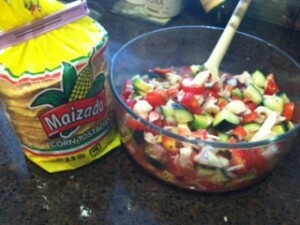 If you like Ceviche, you will love this. It’s an awesome “light” meal – great for summertime. 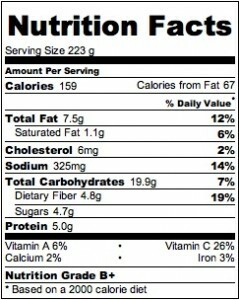 We serve it on crispy tostado shells or it can be served with tortilla chips. Enjoy!! 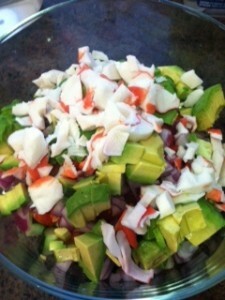 Veggies and Crab make up this delicious summertime meal. Dice cucumber, onion, tomato, avocado, crab and place in bowl. Pour Clamato Juice and Lemon Juice over the top. Salt and Pepper to taste. 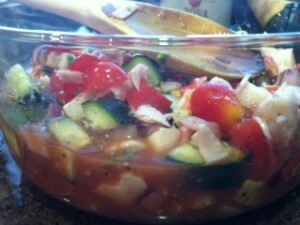 Stir well and refrigerate to marinate and cool until ready to serve. Great to make ahead of time and serve the next day. Servie on Tostado Shells or with Tortilla Chips. Great as a main dish or appetizer. Double or triple depending on how many people you want to serve and how much leftover you would like.